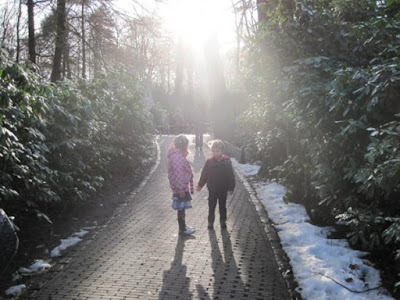 Our Wandering Family: The Land of Efteling and "Oud en Nieuw"
The Land of Efteling and "Oud en Nieuw"
The period between Christmas and New Years here in The Netherlands can be quiet and peaceful, giving one time for reflection. It can also be crowded and chaotic, especially when a day of good weather, school holidays, and the brief seasonal opening of the Efteling Theme Park fall on one particular day. Though it took us 45 minutes more to get into the actual park, a merry feeling permeated it, and paths were adorned with lights and trimmed in snow and icicles (both real and fake). 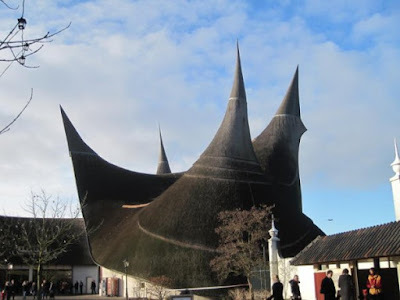 Street performers danced for us when we wound up their oversized music-box, and Cirque du Soleil-like acrobats dangled precociously from the towering thatched-roof ceiling of the "House of the Five Senses". We walked through the "Sprookjesbos", feeling as though we were a part of the fairytales themselves, and sipped on hot "Chocomel". It was a special day indeed, especially considering that it may well be the only children's park in the world were one might smell marijuana (or what one imagines marijuana to smell like [she writes, smirking] ) drifting from a passerby. But now it's just another milestone of 2009, and as we prepare to embark on the grand adventure of 2010, I want to wish you the same that I wish for our family: a year of joy -- brought on by wise decisions - and experiences - that will enrich your life. In The Netherlands New Year's is known as "Oud en Nieuw". So here's to hoping that this "Nieuwjaar" be another incredible year of "Life. Adventure. Together."... wherever it might lead us. Wishing you all a memorable and pleasant family New year!